Keeping food fresh for an extended period of time has presented quite a challenge throughout the ages. People discovered that cold temperatures can have this effect and kept their food fresher under such conditions. Still, at warmer temperatures they had to consume products faster as foods couldn't remain edible over time. Over the years, research has led to the invention of refrigerators which was a point in time which revolutionized life as we knew it by preserving food at cool and cold temperatures. This partially solved the issue. But to keep food fresh in the refrigerator we were left with few options. Plastic wraps work to an extent but it’s a bit difficult to stack food containers covered in plastic wrap, let alone taking food out of the house for any number of reasons. Along came Rubbermaid and Tupperware to answer that challenge. Rubbermaid is an American brand of food storage containers founded in 1933 in Wooster, Ohio. Tupperware is an American brand of home products designed for preparation, storage and serving of food founded in 1946 in Orlando, Florida. Rubbermaid products are specially designed plastic containers of various sizes which can be sealed with rubberized lids to keep food fresh for a longer period a time. An innovative system developed by Rubbermaid ensures that lids snap to bases to allow for easy storage when the product is not being used. Troubles with finding the right lid for the plastic container are now over. Tupperware products are made of resistant plastic. The containers have various shapes and sizes and are sealed with rubberized lids. They can be easily stacked. Product lines offered by Rubbermaid include Easy Find Lids, Premier, Produce Saver, Lock Its, TakeAlongs and Bulk Storage. Easy Find Lids products ensure the food stays fresh and you can easily store them after use due to system of snap to bases. Premier products are made of Tritan plastics to avoid any odor interaction or stains. The Produce Saver line is suited for preserving fruit and vegetables for up to 33% longer. Lock-Its products rely on four locking tabs to securely seal the content. TakeAlongs are available in various shapes and sizes. They use the Quik Clik Seal to notify through a click the sealing. Bulk Storage products are modular items allowing for smart storage options. Tupperware product lines include FlatOut, Fridge Smart, Stuffables, Bungee, Ultra Pro and Ultra Plus. FlatOut is a line of bowls which are flat when stored, but can expand to hold food. The Fridge Smart line includes products with air control vents to store in the refrigerator. Stuffables and Bungee are products specially designed for overfilling cases. Ultra Pro and Ultra Plus are heat resistant casseroles. 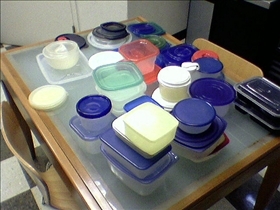 Rubbermaid and Tupperware are American brands which offer food storage products. 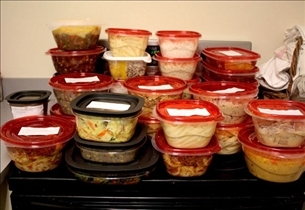 Rubbermaid and Tupperware are plastic containers of various shapes and sizes sealable with rubberized lids. Rubbermaid product lines include Easy Find Lids, Premier, Produce Saver, Lock Its, TakeAlongs and Bulk Storage. Tupperware product lines include FlatOut, Fridge Smart, Stuffables, Bungee, Ultra Pro and Ultra Plus. Which storage system has the best locking features? I personally prefer tupperware as I am selling those in montreal, quebec, canada. Thank you for your hard work! I am a Tupperware employee here in Hemingway, South Carolina. I am a Tupperware Consultant In Jasper, IN and they don't put on here that Tupperware has a Lifetime warranty on their plastic containers. Rubbermaid only last 2 months on average on their high end products. If you're buying every 2 months you're spending a lot more than you'd spend in a year on one piece of the same size of Tupperware. I have both Rubbermaid and Tupperware. The newer Rubbermaid is easier to store than the old round ones. Sold Tupperware for a few years. I prefer Tupperware as it definitely lasts longer. I still have some of my grandmother's Tupperware and it works as well as newer Tupperware. The picture on the right doesn't look like Tupperware brand at all. Didn't anyone notice that? And, all of the containers on the right are empty and old. I don't see any Tupperware brand containers here for a true comparison, but I will say this,Tupperware is a far superior product to that of Rubbermaid. There isn't a comparison. More expensive? Yes, but a quality product! I bought $90.00 worth of Tupperware in 2011. The lids never stay on when I put them in the fridge. The Rubbermaid lids go on easier and stay shut. My Rubbermaid containers are from 2012, cost me $18.00 for comparables, and look as good now as they did when I bought them. Rubbermaid stacks better in the fridge. Rubbermaid can transport milk without tainting. Tupperware that was used for milk once was relegated for storing spare bobbins in my sewing closet. Yeah, the Tupperware I have will last longer, because I only use the Tupperware when all the Rubbermaid containers are in use!